A vast array of Indigo Blu stamps waiting for new homes. Behind you can some of the samples Lisa, Georgina & I have been making in the last few weeks. They will be posted on the blog in the coming weeks. And before we knew it, 9.30pm rolled around & another class day was over. Hopefully, everyone enjoyed themselves & are pleased with their projects. It's shaping up to be a really fun day & we hope to see lots of you there. 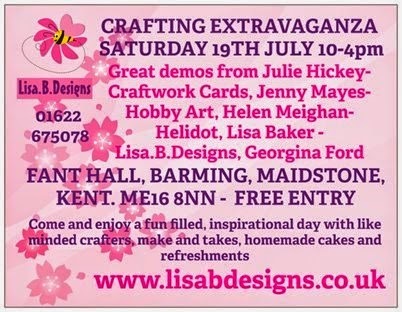 There will be lots of crafting goodies to purchase, a humongous SALE & a raffle with lots of prizes to be won. The raffle this year is in aid of THE HEART OF KENT HOSPICE, who do the most amazing work. So, please spread the word, invite your friends & join us on the 19th.